Qigong, also known as Chi Kung or Qi Gung is a type of Traditional Chinese Medicine (TCM), along with Acupuncture, Herbalism, and Dietary Therapies. Evidence shows that Qigong has been practiced as far back as 4000-years ago. Like all methods in TCM, it works on the Chinese theory that the primary moving force of the universe is called Qi (pronounced Chi or Ki), or the vital force. Qi is what makes up all substance and creates all movement and life. Proponents of TCM believe that the human body contains lines (meridians) in which Qi flows, thus disease is caused by a disruption in Qi flow through the meridians. Qigong aims to prevent or correct Qi disruptions through the use of rhythmic movements, breathing, and posture. Qigong is usually grouped-in with other traditional Chinese movement arts such as Tai Chi and Kung Fu; both considered ‘martial’ arts. Tai Chi (also spelled: Taiji) is closely related to Qigong in that both arts focus on the circulation and development of Qi through the use of breath, posture, and movement. 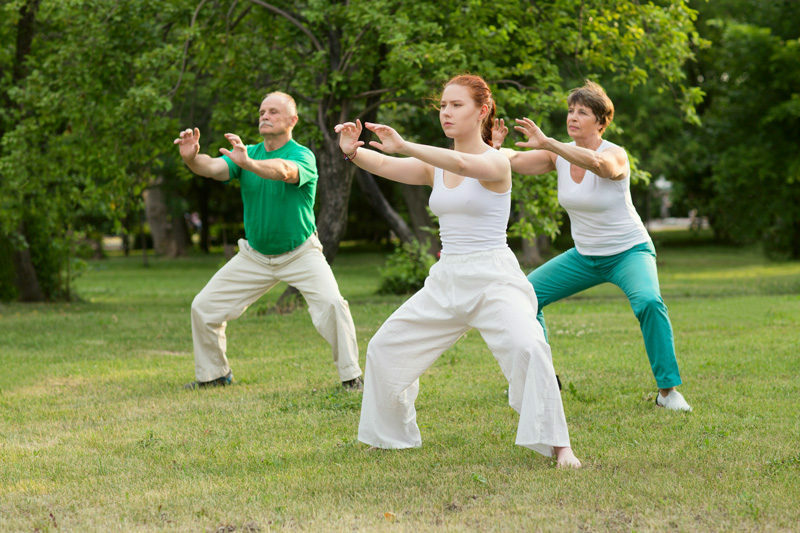 Tai Chi and Qigong are both performed in a slow, rhythmic manner. The difference is that Tai Chi movements are based, in theory, around fighting stances and movements and is hence considered a martial art, whereas Qigong movements are generally non-martial and considered a form of moving meditation. From a Traditional Chinese Medicine standpoint, Qigong is one of the primary forms of exercise used to treat and prevent many ailments in the sick and elderly. There are dozens of styles and the best style for the situation is chosen by the practitioner. The effectiveness of Qigong is based on outcomes such as balance, handgrip strength, trunk flexibility, blood pressure, resting heart rate, sleep and quality of life. There have also been studies on leg power, cardiopulmonary endurance, and pulmonary function, but these outcomes need further study. Research has shown that regular Qigong practice appears to improves balance, coordination and hand grip strength in the young, elderly, and those with Parkinson in as little as 8 weeks. Adequate coordination and balance are very important to the long-term health of aging populations, as well as those with neurodegenerative conditions such as Parkinson’s and Alzheimer’s. It also appears to reduce stress which may account for its positive effect on sleep. For the most benefit Qigong should be practiced for 30-60 minutes each week. Although Qigong is a great way to improve many health and coordination with a no-impact form of exercise and mobility training, it should be taught by an experienced practitioner because there are many forms to choose from. So, before you start a daily Qigong practice, be sure to look for a certified teacher in your area. You can find a local teacher through the National Qi Gong Association page. How Do You Determine Your Fitness Level?